Some time between 1900 and 1902 Meletis saw a woman in his dreams and she told him that her name was Saint Anna. He had fallen asleep while his sheep were grazing in the region of Dakryes in Steni. When Saint Anna appeared to him, she said: "I am Saint Anna, the mother of the Panagia, and I have been buried here for 800 years. I want you to take me out and build me a church." She then indicated to him the place where he was to dig - from one point to another - and she told him not to hurt the oak tree there. "But I, Saint Anna, am very poor and have no money. How will I build it?" he said to her. "It will cost you 200 drachmas and I will help you find it." Meletis woke up and went to tell his wife Mario about this dream. She said that they should go and dig at that spot indicated. When they arrived at the spot, they considered the fact that there was not even a rock to indicate that there had been something there at one time. It was a field of reeds that had recently been reaped. Considering these things, they decided to leave it alone and blew it off as just being a dream. However, Saint Anna appeared to him again and issued a complaint: "Why don't you believe me? Go and dig and you will find a wall of iconography, a Holy Altar, and under this my icon and a Constantinian coin. Know however that you will face many difficulties and obstacles, but you are not to cease nor listen to anyone." At dawn he went and told his dream to the literates of the village, and they mocked him saying that the chapels must be ruined not fixed, because animals lived in them as well as unclean people, and no one lit their oil lamps. When Meletis heard this, he again changed his mind and abandoned the project. 'I can't,' I said to her. 'You can. Get up and tell your father to do what I told him to do.'" They said this to Meletis and he again considered digging. In the meantime, Meletis again saw Saint Anna and she told him to bring Mitra with him to help with the digging. They went, dug, and indeed found a wall of iconography. The colors were so vivid it was as if they were painted yesterday. They then found a stone slab. At this point they stopped digging, because autumn had come and they had to leave to bring the sheep to protected land against the winter months, and also school had started and Meletis did not want to be mocked for chasing after dreams and looking for ancient ruins. Despite all that he had thus far found, Meletis began to neglect the ordinance of Saint Anna again. Winter came and they went to Soros at Drosia. Saint Anna again appeared to Meletis in his dreams, but this time she was angry and she told him with austerity: "Why did you not listen to what I told you, Meletis? At the spot where you began to dig and found the wall and the Holy Altar, certain people from Kathenous went and thought they found some ancient ruins, so as they were digging they broke the Altar, threw the pieces off a cliff, and from the blows of their digging they cracked my icon, but they did not see it, so they left." Meletis woke up confused and told his wife: "Mario, I'm gonna go see if this indeed is the case. No one will stop me. I will not listen to anyone." So he went, and indeed the Altar was in pieces. When spring came he began to dig again, and he found the cracked icon and the coin. He began to build the church with the financial help of the Metaxas family from Piraeus, who were in the village and had heard from the people of Steni everything that was going on for a long time. The cost was indeed 200 drachmas. With the passage of time, the church began to take in water and they had to do something so that it would not fall. 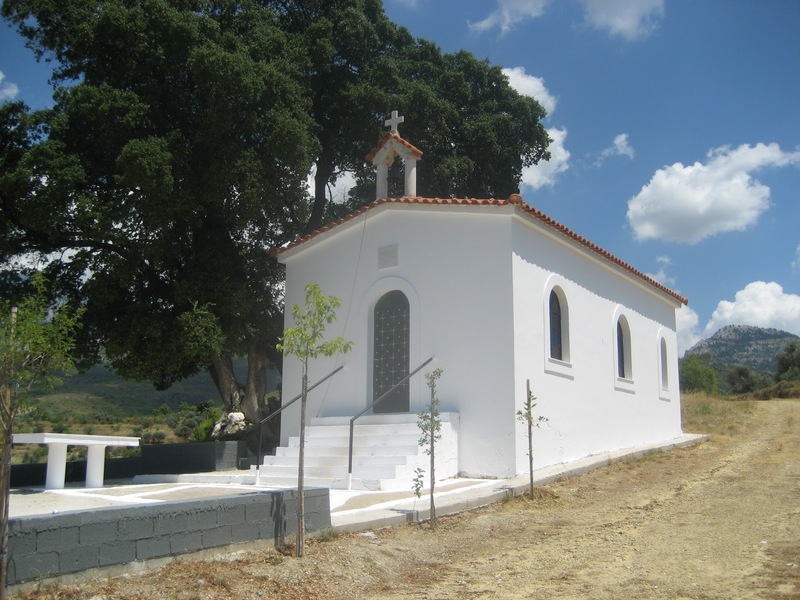 In 1968 Spyros Angelis, the son of Meletis, consulted with his brothers and sisters to rebuild the church. Therefore they put down a new foundation and rebuilt the church that exists today, with the oak tree remaining in its place, according to the wishes of Saint Anna. Of course, every year the children of Spyros make some renovations. As for the icon now, initially it was in its place on the left wall before entering the sanctuary. In 1987 the grandchildren of Spyros Angelis went to light the oil lamps and saw the icon was missing and the frame was hanging from the oak tree. Perhaps it was stolen with other icons from surrounding chapels in the area. The Chapel of Saint Anna did not liturgize unless a priest was invited to do so. However, at the other chapels the priests would liturgize at will. Mario used to narrate how one year she with other women made ready to commemorate Saint Anna with a liturgy, but a priest never showed up, so they were forced to leave, saying: "We, Saint Anna, came to liturgize, but a priest didn't come, so we will leave as we came." Then they saw tears running from the eyes of Saint Anna's icon. Now every year, on July 25th, the feast of the Dormition of Saint Anna, a priest comes without fail to liturgize in the chapel together with the grandchildren of Spyros Angelis, and they do an artoklasia and offer food after for everyone that shows up to celebrate.